My Tuesday morning watercolor class has been working on mastering some brush strokes that create both crisp and soft edges. For this project we worked on morning glories from a photo reference that I brought in. 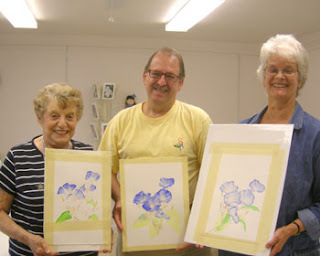 Ruth, Mike and Judy all have worked hard and the results are really beautiful paintings. My snowbirds are leaving for the summer, so they will finish their pieces when they get home, but I am confident they will turn out great!